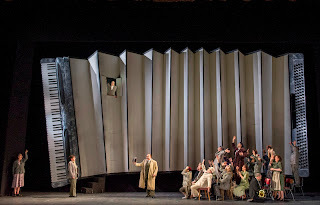 The Moravian genius still splits opinions into fierce pros and cons, as testified by reviews (mine for The Arts Desk included) of Richard Jones’s ENO Julietta*, pictured above and below for English National Opera by Richard Hubert Smith. Many of us – a majority, it would seem - love Martinů’s music to the point of the irrationality it seems designed to provoke. Others find it ‘not very good’, ‘superficial’, ‘anonymous’ and derivative, lacking ‘dramatic immediacy or distinction’. I won’t single out the critics who number among the dissenting third, but the more I get to know Julietta, the more moving and coherent I find it, so naturally I want to challenge them. Of course surrealist treatment of someone else’s dream spread across three acts and nearly two hours of music has the potential to become one colossal, not to mention dated, bore. But protagonist Michel’s sleepwalking attempt to find the woman he heard singing at an open window surely provides the meaningful anchor one of those writers finds missing in the score. There’s an important ritornello in each act when he remembers and tries to bring to life that vision: music of heartache and pathos which stuck in my mind the first time I ever heard it (so much for unmemorability) and culminates in the fabulous cadence of the two ‘Julietta chords’**, rooted in Janáček’s Taras Bulba and going on to pepper Martinů’s six masterly symphonies of the 1940s and early 50s. I first quoted the chords here, musing on the Third Symphony; no harm in reproducing them again. That refrain’s last playback leads to the ambiguous ending: to pursue his goal again, Michel must be lost to the real world, where others before him have gone insane. But is it worth it for sounds like this? Martinů’s painfully nostalgic musical resurrections of the past convince you (sorry, me) it might be. The three Julietta visions take place in three very different dramatic contexts. Jones and his fabulous designer Antony McDonald have taken the cue of the sentimental tune which kindles memories in an amnesiac dream-community to render a giant piano-accordion and to deconstruct it in various ways. I’m taking the liberty of giving the three stage pictures (dreamville, as I like to think of it, up top; the forest of Act Two below; accordion as filing-cabinet for the Office of Dreams further down). As in all of Jones’s work, design and production are hauntingly fused. The wistful, very Moravian strains which the accordion conjures for the memoryless add a further layer of something to hold on to, akin to the impact of Ann Trulove’s lullaby on the tormented inmates of Bedlam in Stravinsky’s The Rake’s Progress. Again, Martinů offers respite from the fidgeting absurdity of dreamville, a lyricism which in my view is far from ‘stubbornly earthbound’ (one of the dissenters again). I can’t imagine Georges Neveux’s original play being anywhere near as rooted; Martinů’s music,when it briefly settles, is balm for troubled souls. As for ‘its manifold derivations failing to cohere into a greater whole’, the composer's stylistic thumbprints transfigure every debt, from Debussy to Stravinsky. I need a whole chapter to show how, but the symphonic example at the foot of this post gives a taster of his unique musical world. Dramatic incoherence? Up to a point: the non-sequiturs of the somnambulent world demand it***. But I’m always surprised by the urgent twists and turns of the longest act, where Michel meets up with his dream girl again in the wood at night. 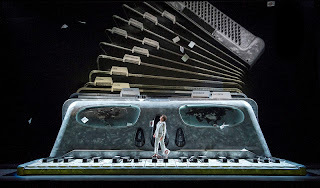 The act constantly seems to have reached its logical conclusion, but the music goes on eluding expectations, above all by settling not to the hectic brilliance of the orchestral passage which Jones and his movement director Philippe Giraudeau choreograph as a queasily humorous crocodile ballet, but to the serenity and beauty of a quiet musical curtain as Michel heads for the deep waters only. In a contemporary world where so many of us are grappling with the problem of Alzheimer’s somewhere in the family, the theme of memory has disturbing new resonances. Is Martinů’s music worthy of it? In its fleeting beauty and tenderness, I think it is. To conclude, and to meet one critic’s objection that the composer’s many threads never cohere, here’s the start of the symphonic adventure with No.1, and the essence of Martinů’s personal style - the chromatic bloodrushes, the syncopated dance music, even the Julietta chords - in the nutshell of the first minute. There are other movements from other symphonies I might have chosen, but the performances on YouTube don’t come up to the mark of Neeme Järvi’s great Bamberg cycle, of which this is the first instalment. *Plenty of ticket offers available, or at least there were before first night; the generally warm critical reception may have changed all that. One ENO 'special' entails phoning up the box office and saying the magic word 'dream'. ***28/10 Here's another contrary view I've just come across: the music 'proceeds in fits and starts'. Didn't they used to say that about Janáček? And actually it strikes me there's a very strong parallel with another dreamlike opera which only makes sense at the end: Janáček's Osud, where protagonist Zivny finally pieces it all together - at greater length, admittedly, than Michel, but to similar effect. I can't tell you what a joy it is to read you in full throttle explaining with passion why you love a piece of music. As always you bring me to things that are either unknown or that I have chosen to neglect. As you know we saw an incredibly emotional production of The Greek Passion in Palermo just before we left Italy. I came out of the performance trembling and on the verge on tears. I do wish I could be over there to see the Julietta. And by the way that clip of the 1st had me running to iTunes to see what was available. The set designs are amazing. 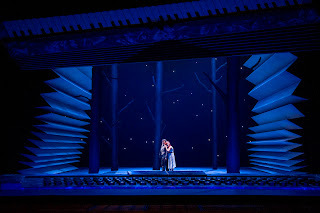 Why is it that opera beats straight theatre hands down in terms of imaginative sets? I can't wait to see the opera now, and discover more of Martinu's music, after what you've written. Willym - The Greek Passion couldn't be more different than Julietta, but I love its relative simplicity, and who couldn't be moved by the final scene as the exiles move on? I've seen it twice at the Royal Opera, and Belohlavek gave a magnificent concert performance at the Edinburgh Festival some years ago. We should have seen it in Prague, too, but for some reason it was pulled in favour of Rigoletto. Which we still went to see, and I'm glad we did, since the baritone, Pavel Kamas from Brno, was the best I've ever heard in the role. Philip - Antony McDonald is as much a genius of the theatre as Richard Jones. His ballet designs, Cinderella especially, are amazing. I do hope you go on to listen to all the Martinu symphonies - each and every one a gem. David, thank you for this review of an author we do not hear much of here in Ottawa. I too remember the production at the Massimo in Palermo of the Greek Passion, a beautiful piece of work. Am always interested in learning more about a composer and will look up the other works. “so naturally I want to challenge them.” Ah, wonderful words, and how marvelously you take up the challenge! I know not a whit about Martinů’s music, so am busily listening as I write. The quotation from Martinů is gorgeous and poignant (and, as you note, offers special personal resonance for many—of course, this put me in mind again of Adams’s The Wound-Dresser). I was struck particularly by this: "The world appears here only at the given moment, which is replaced by the next moment, and so everything rushes into emptiness.” Last not least, I heartily second what Willym has written in the first para of his response! Now, here's the thing: your pathetic amateur here can't find the Julietta chords in the Youtube you posted. If it's not a bother, would you be able to pinpoint the time on which they appear on the YouTube? Yes, Sue - they appear at 0'32 and again at 0'38 - not climactically, as in Michel's visions, but very much as a passing part of the general lilt. Now I hear them! Thank you so much, and also for the introduction to Martinů. I fell in love with Martinů quite some while ago, having moved to Boston for College. Boston is a very adventurous city musically and has a nice Martinů tradition at the Boston Symphony. That said, productions of his operas here are very few and very far between. Julietta looks fab. I wonder if I can prise She away from her busy work schedule to get to see it before it closes? And I'm a sucker for anything involving accordions or bandoneons. Inspired by your enthusiasm I have dusted off a rarely played 2 CD set of Martinu's 4th Symphony with various concertos etc. acquired not long ago. Having said that I find it harder with age to decide on what music to hear and most of it stays on the rack these days, especially when you can call most anything up from youtube or trawl through iplayer. "In my youth" I was hungry to acquire and explore ever more stuff. Now I have your recommendations to follow! Will - Boston was so lucky to have Martinu on tap in the 1940s and 50s, and he was lucky to have Koussevitzky and Munch as interpreters. The First, Third and Sixth Symphonies were all first performed there, as no doubt you know; 3, which hit me like a ton of bricks when I first heard it in concert a couple of years back, has one of the great endings of any symphony, and the Fantaisies Symphoniques, in other words 6, have never been short of great intepreters. Howard - that's a good little set to have. The Fourth was the one out of the six I said I'd like to do for R3's Building a Library, chiefly because this time it has one of the greatest slow movements I know. So I'm glad that's there, and the Weller performance isn't bad. The dark and powerful Double Concerto contrasts nicely with the smaller-scale, but still as ever humane and personal, Concerto for string quarter and orchestra and wind Sinfonia Concertante. Memorial to Lidice is as grave and moving as it should be. Happy listening! Finally, Sue - you (perhaps diplomatically) didn't say whether you liked what you heard. I hope you did. Congratulations on, and many thanks for, your excellent review on Arts Desk and on your perceptive piece here. I know what a passionate advocate you are of Martinů’s music, and thank heavens someone is out there doing this. I, too, adore his music, and yesterday evening, Saturday 22nd September, I had my first opportunity to see a production of ‘Julietta’ in the flesh. I should add that I had strongly proposed this piece to ENO’s folk during one of their Friends gatherings, and I thoroughly applaud their courage in putting it on, especially given the continuing, and to me incomprehensible, debate about the merits of Martinů’s music. Some of the more abrasive reviewers simply don’t get it, never have got it and never will. Now, in the middle of Sunday afternoon, I am still feasting on my vivid memories. 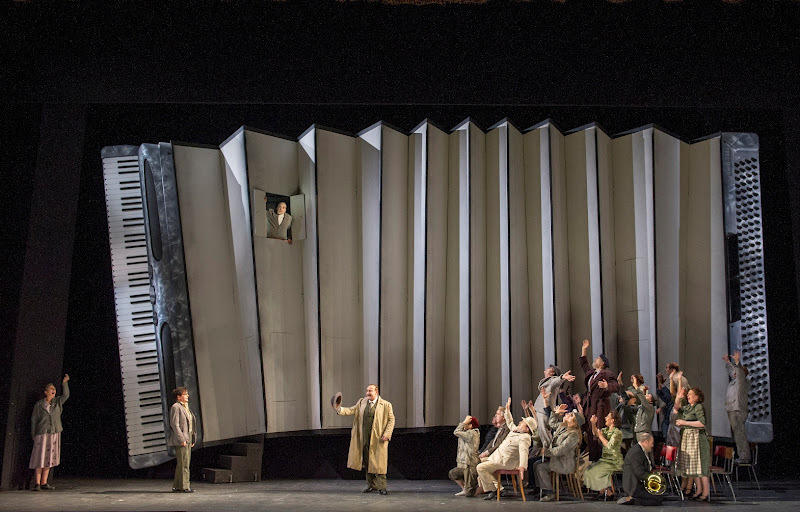 The sets and lighting were marvellously imaginative and no less breathtaking than Glyndebourne’s gorgeous ‘L’enfant’ this year, as our pictures show. 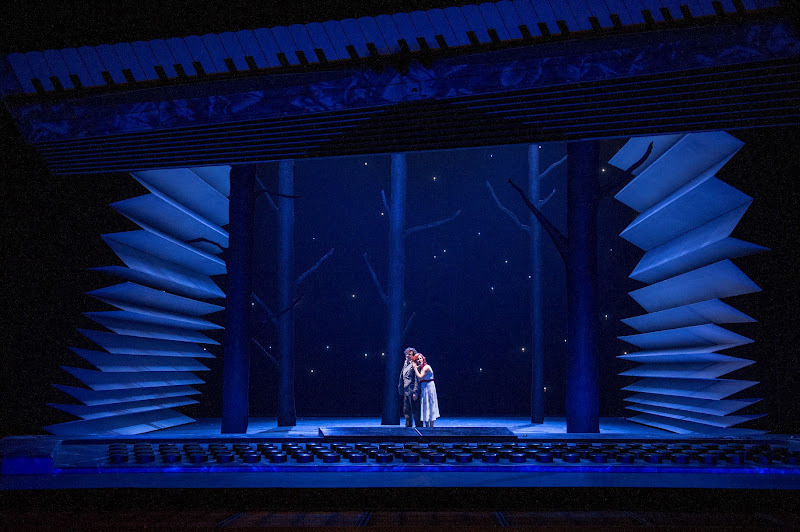 The production honoured both the surreal fantasy of the text and the beauty of the music, and it also subtly balanced the genuinely funny surreal moments against the deeper tow of the dream/reality drama. And how fabulously the ENO players and Edward Gardner committed themselves to Martinů’s complex score. For those with ears to hear, all the trademarks are there. I have a particular addiction to Martinů’s motoric motifs as they build up a head of steam, and I especially love what I would call those ‘percolating’ chromatic scales that bubble up right through the orchestra and end in a glorious burst of sunshine. And then, as you so rightly point out, there are those sublime ‘Julietta’ chords (Moravian cadence). I was very glad to have read your piece before I went yesterday and was on the lookout for their appearances at the ends of the Acts, but I was quite unprepared to be so overwhelmed by them in the ‘Love Duet’ and that wonderful passage that appears to start with a string quartet and builds into a huge climax. Also, if one listens carefully, as in the symphonies, one can hear constant echoes and small references to these chords, especially in Acts 2 & 3. I expected to be a bit bored by Act 3 after the intensity of Act2. Not a bit of it. Michel’s desperation is heart-rending, and his final dream-sequence, working over the ‘Julietta’ chords, is heartbreaking. The Groundhog Day return at the end is brilliantly ambiguous; he is lost if he does and lost if he doesn’t. And just how like life that is! There are numerous splendid individual performances in what is a genuinely ensemble production of great distinction. Julia Sporsén was excellent as Julietta, meeting all her dramatic and musical demands, while Peter Hoare as Michel was simply astonishing, both as a resilient and moving singer and as an extraordinary actor. What a stage animal he is! Quite mesmerizing. Now I realise just what those ‘Julietta’ chords mean within the context of the symphonies, and this makes them and the opera all the more poignant. There are still four performances in the next couple of weeks. If you haven’t seen it and can get to it – please do so! A wonderful evening. I am listening to Martinů once again now, the first, and now the second symphony. It will take me a bit to sort it all out, but the word that comes to mind immediately is transporting. I will be looking for opportunities to hear Martinů live from here on out. thank you very much, both for your original review, and for this piece. I also wanted to contribute a few words but see now that most of what I could write here would be superfluous after all the wonderful comments here. I was surprised all the criticism of Martinů music was essentially the same as 30 years ago. Over the years, persons involved in the split have changed, yet the split remains the same. Max Brod, a music journalist among many other activities, once formulated his philosophy as reviewer. He saw is primary task was to accept the author´s standpoint at the beginning, to listen, to watch, to feel, to live with the piece and to enjoy it (if possible). ONLY THEN was time for analysis and review. In contrast I always imagine a critic "on the other side of the barrier" has a checklist. Instead of enjoying the piece he just checks. Does it have this? Does it have that? Is the development as it shoud be? Ah! Here! That was clearly borrowed from Stravinsky! The critic is so busy with checking his checklist he does not really have time to recognize the elusive miracle taking place in front of his eyes. Maybe a rather naive point, but that is how I see it. Ad Julietta: years ago, I saw two different Czech productions. As far as the stage and direction, it was probably very different from the London production. Still, I can very much agree with what "Hedgehog" wrote above. To my knowledge, it was never broadcast, nor there is a DVD available. Jan - good to see you here, and how right you are about the confirmation of prejudices, and especially this: 'The critic is so busy with checking his checklist he does not really have time to recognize the elusive miracle taking place'. I think it must be that TV film you mention which a colleague of mine once played on a video, though I never got to see it. The video certainly hasn't yet made it to DVD transfer. And in the meantime I see Martinu 'criticism' has reached a new low in a Spectator review by Michael Tanner - whose style I usually like, though not always his opinions - ending in the word 'worthless'. So now we know.